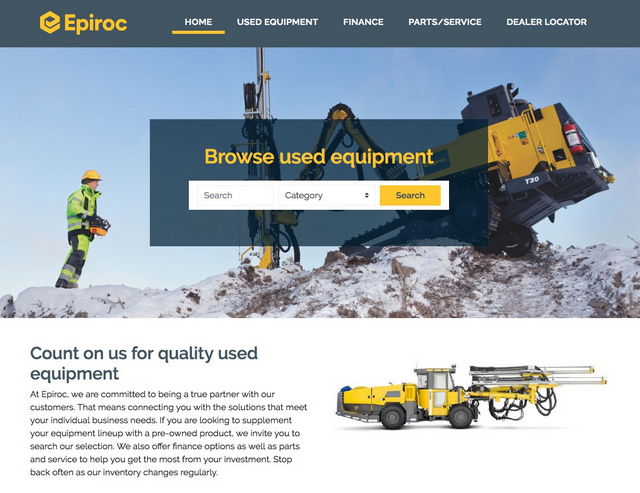 The new Epiroc Marketplace website simplifies the process of searching for and purchasing used mining and construction equipment. Featuring a robust selection of quality pre-owned machines along with finance options, epirocmarketplace.com connects customers with solutions such as drill rigs, loaders and trucks, rock drilling tools and hydraulic attachments to help supplement their equipment lineup. The Epiroc Marketplace site houses used equipment available at Epiroc stores and dealers across the U.S. The website’s user-friendly design enables visitors to search for used equipment by product category and specific product. The profile of each pre-owned product includes: a photo, make, model and condition information; specifications; and the option to request a quote. Used products available through the frequently updated site include: drill rigs, excavator attachments, loaders and trucks, mechanical rock excavation equipment, raiseboring equipment, rock reinforcement equipment, rock drilling tools, and ventilation systems. Users can locate nearby Epiroc dealers and the used equipment they carry using the Epiroc Marketplace dealer locator tool. This easy-to-use tool enables customers to discover Epiroc dealers using a search bar and interactive map that highlights dealers in surrounding areas. Epiroc Marketplace makes financing mining and construction equipment customizable to individual customer requirements and projections through Epiroc Customer Finance. Customers can work with Epiroc representatives to develop financing options that will help them acquire equipment without impacting other lines of credit. Epiroc offers leasing, hire-purchase, supplier credits and other types of financing. The financing section of the Epiroc Marketplace site includes the option to submit a finance application to begin the process of making affordable payments over an extended time period. Support for Epiroc equipment and quality spare parts are accessible through the parts and services area of the website. The site can guide customers to nearby stores and dealers, as well as limited-time promotions and discounts on Epiroc tools, accessories and parts. For more info on Epiroc, click this link. You won’t be sorry.